In an ideal world, on 18 December 2016, the Dutch players will be carrying Henk Groener out of the Scandinavium in Gothenburg with an EHF EURO medal around his neck. It would be the deserved end to Groener's career at the helm of the Dutch women's national team after he recently announced that he would step down as women's head coach on 1 January 2017. "I look back with pleasure at this time in which we managed to grow Dutch women's handball, after a period of absence from big tournaments, to a country that is not only naturally present at European and World Championships, but that also participates in the battle for medals," said Groener in a message distributed by the Dutch federation. In the most recent past, Groener has led the Netherlands to the EHF EURO 2014 and 2016, to silver at the World Championship 2015 and to a fourth place at the Rio 2016 Olympics. The 55-year-old, who turns 56 on Thursday (29 September) has been at the Netherlands' helm for eight years or 146 games. "However, we shouldn't look back but forward. The Dutch national team is on its path towards the Olympics in Tokyo. It is necessary for the team to be accompanied by a coach and staff who see this route also for themselves as a whole," said Groener. "And when I have doubts this time is the challenge I see for myself at the moment, it is an indication that this is probably not the case. At such times it is important to make choices that are best for Dutch women's handball." 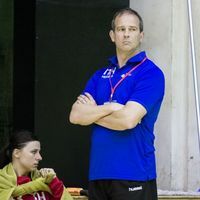 It is not yet decided who will succeed Henk Groener as women's head coach.